Lactococcus lactis is one of the most extensively characterized lactic acid bacteria, from physiological traits to industrial exploitation. Since last decade, L. lactis has been developed into cell factories for the production of bioactive compounds such as enzymes, vaccine antigens and natural products. However, its precise and efficient genome editing tools is still required to make L. lactis more suitable candidate for engineered functionality. A high active recombinase, RecT of Enterococcus faecalis ATCC14506, was selected from six candidates and mediated homologous recombination between single-stranded DNA (ssDNA) and the L. lactis chromosomal rpoB locus with an efficiency of 100% after rifampin selection. 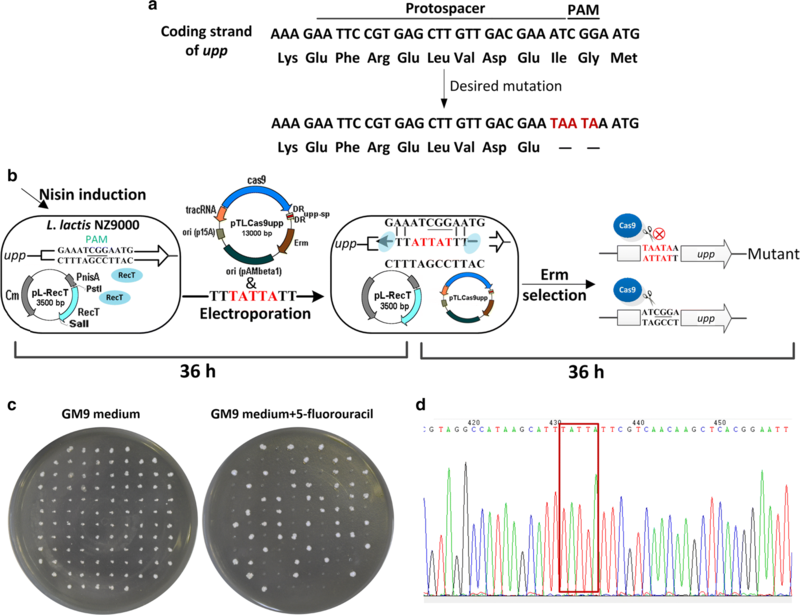 To screen mutants without an externally selectable phenotype, the CRISPR/Cas9 system was used for counterselection, yielding an upp mutant with an efficiency of 46%. By optimization of the copy number of plasmid carrying the CRISPR/Cas9 system and the length of spacer sequence, the off-target efficiency of the recA, galK, hemN and noxD genes were eliminated. The ability of this optimized tool to perform sequential point mutation was demonstrated using the upp and galK gene loci as targets with improved efficiencies > 75%. Moreover, seamless genomic DNA deletions (50/100 bp) or insertion (a loxP site, 34 bp) was efficiently accomplished within 72 h.
The work provided a rapid, versatile and precise tool for L. lactis genomic engineering by combination of ssDNA recombineering with improved CRISPR/Cas9 counterselection. This tool will simplify the production of isogenic strains for assessment of gene function or construction of biosynthetic host. Lactic acid bacteria (LAB) are a group of non-sporulating Gram-positive bacterium that catabolize water soluble carbohydrates mainly into lactic acid, including Lactococcus, Lactobacillus, Streptococcus, Enterococcus, Pediococcus, Leuconostoc and Oenococcus. They are highly diverse in genetic composition and physiological metabolism . Therefore, the developed genome editing tools in LAB usually performed in a strain specific manner [2–5]. Lactococcus lactis is one of the most commonly used strain in the manufacture of fermented dairy products . More importantly, L. lactis is an ideal cell factory for the production of recombinant proteins and natural products because of its GRAS (generally regarded as safe) status, relatively small genome and simple metabolism . As with deciphering of unknown genes and uncovering of novel biosynthetic pathway, it is key that L. lactis genome can be efficiently edited to fine modify a specific gene or reroute a natural metabolic pathway for desirable end products. Thus, genomic modification is indispensable, including precise point mutation, deletion and insertion of the target genes. Unfortunately, precise genomic modification of L. lactis is more difficult compared with other LAB strains, such as Lb. reuteri, Lb. casei and Lb. plantarum [2–5]. Nowadays, the common techniques for editing L. lactis genome is mainly to rely on RecA-dependent homologous double-crossover events with nonreplicative or conditional replicative plasmids . Although practicable, the RecA-dependent recombination occurs rare, leading to long subcultivation and laborious screening for final mutants . Several modified approaches have been developed to increase the screening efficiency by counterselectable markers, such as the genes upp, oroP, and pheS [10–12]. Nevertheless, these protocols are still imperative performed in two steps (vector integration and co-integrate resolution) and labor-intensive, time-consuming (usually 3 weeks) to generate a prospective mutant. Prophage-derived recombinase operons have been exploited to improve the efficiency of genome editing in several bacteria [13–16]. The well-characterized λ-Red system, consisting of Redα (5′–3′ exonuclease), Redβ (single-stranded DNA binding protein) and Redγ (host nuclease inhibitor), has been used for genomic engineering in E. coli . Recently, two λ-Red like operons were explored from Lactobacillus prophages, and applied for construction of the genome editing systems [4, 5]. Redβ or its analogs RecT can mediate recombination through a ssDNA oligonucleotide which preferentially binds to the lagging strand during DNA replication (ssDNA recombineering), generating subtle genomic mutations [17, 18]. To our knowledge, a functional λ-Red like system has not been reported in L. lactis, while ssDNA recombineering shows great potential to engineer its genome . Considering the diversity and host specificity of the ssDNA binding protein , termed recombinase, seeking functional RecT proteins will greatly improve the homologous recombination efficiency and accelerate the development of the genetic manipulation platform in L. lactis. At the same time, an efficient selection system is still needed for easily screening the expected recombinant. Clustered regularly interspaced short palindromic repeat (CRISPR)/Cas9 system has been used as a mutagenesis screening strategy in L. lactis . This system simply requires Cas9, tracrRNA and crRNA carrying a 20–30 bp spacer target to the chromosomal site . Cas9 is guided to search the protospacer-adjacent motif (PAM), binds and then induces double-stranded break (DSB) at the target site . When used as a counterselectable marker, Cas9-induced DSB at the wild type allele provides fast screening of expected mutant . However, some wild type cells might escape from the lethality of Cas9, probably leading to the false positive subpopulation. And, it is still difficult to obtain a point mutation, deletion or insertion mutant by CRISPR/Cas9 counterselection because of the low efficiency of the endogenous homologous recombination in L. lactis. 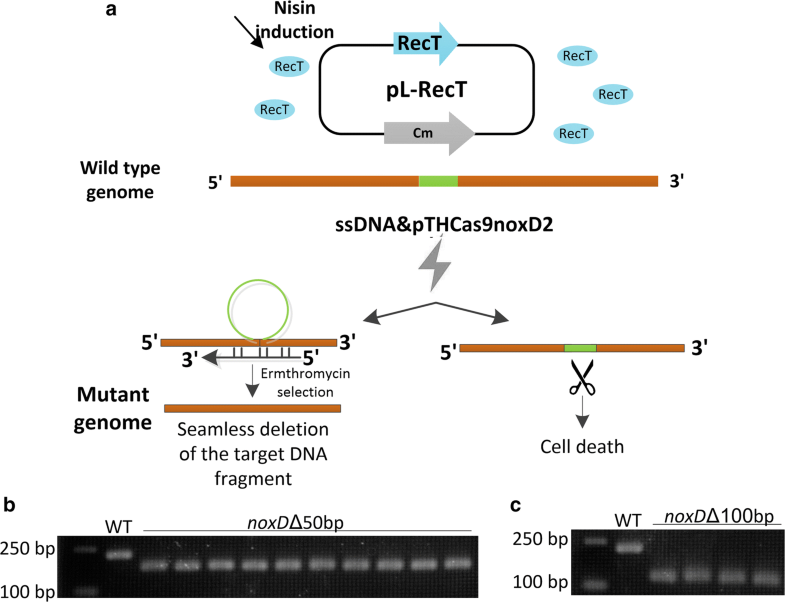 To obtain the final mutation efficiently and simply, the CRISPR/Cas9-assisted ssDNA recombineering system has been reported in Lb. reuteri , while it is still not applied to L. lactis. In this work, according to the previous reports and available prophage sequence information on NCBI database [4, 5, 14, 17–19, 24], the recombination activities of six known and predicted recombinases were tested in L. lactis. And, the specificity and efficiency of Cas9-induced DSB was improved. By combining the ssDNA recombineering with CRISPR/Cas9 counterselection, a tool was developed to meet the urgent requirement for an efficient and reliable system for L. lactis precise genomic engineering. 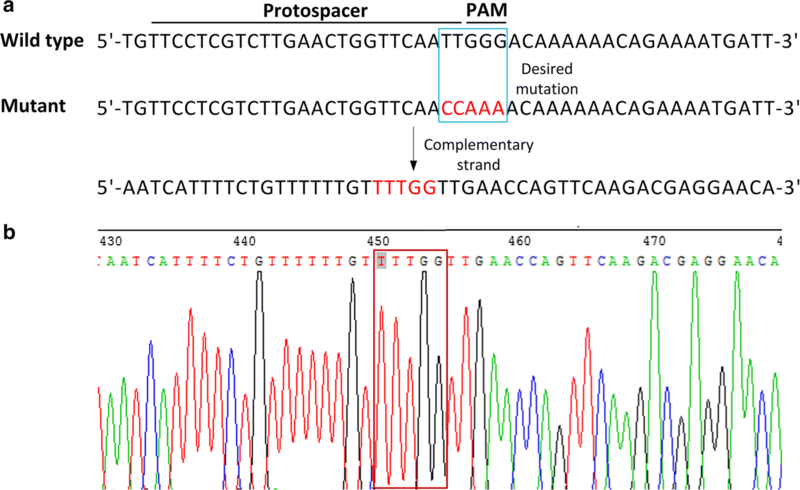 The activities of six characterized or predicated prophage-derived recombinases were tested by evaluating their function to mediate ssDNA recombineering of the rpoB H486N mutation conferring cells with rifampin resistance . In L. lactis NZ9000, the nisin of 10 ng/mL was used to induce the expression of the six candidates: Redβ, recombinase of E. coli λ-Red system; RecT, derived from E. faecalis ATCC14506; LCABL_13050 and Lp_0641, recombinases from Lb. casei BL23 and Lb. plantarum WCFS1, respectively; phiJB_00020, a predicated ssDNA binding protein derived from Lactobacillus prophage; pi12, a putative recombinase identified on the basis of protein homology from L. lactis IL1403 [4, 5, 25–27]. After electroporation of 100 μg ssDNA oligonucleotide rpoBo1 into L. lactis NZ9000 cells expressing the recombinase, the rifampicin-resistance colonies were counted. As shown in Fig. 1a, a total of 145, 1253, 65, 19, 0 and 0 colonies were obtained in three independent experiments mediated by Redβ, RecT, LCABL_13050, Lp_0641, phiJB_00020 and pi12, respectively. The RecT showed the highest recombineering activity, and 20 randomly picked colonies were confirmed to carry desired mutations by MAMA-PCR and sequencing analysis (Additional file 1: Fig. S1). Moreover, decrease of the ssDNA oligonucleotide dosage showed that as low as 10 μg generated almost the similar number of recombinants compared with 100 μg (Fig. 1b). Therefore, the RecT was selected for ssDNA recombineering in L. lactis. To achieve recovery of mutants without an antibiotic resistant phenotype, the CRISPR/Cas9 system from Streptococcus pyogenes was applied to kill wild type cells after ssDNA recombineering. As previously reported , three genetic elements Cas9, tracrRNA and crRNA were introduced into a low copy number plasmid pTRKL2 (Ermr), generating pTLCas9. Recombinant cells harboring the desired mutation on the spacer sequence or the PAM site can survive in the presence of erythromycin. The first trial aimed to bring five successive bases (from 106 nt to 110 nt) mutation in the uracil phosphoribosyltransferase (UPRTase) gene upp, which would generate two proximate termination codons (Fig. 2a), conferring cells with 5-fluorouracil resistance. Following the nisin induced expression of RecT in L. lactis, the ssDNA uppo and the targeting plasmid pTLCas9upp were co-electroporated (Fig. 2b), generating 106 erythromycin resistant colonies per 109 competent cells. A control was set by co-electroporation of the ssDNA uppo and pTLCas9 containing an invalid spacer, yielding 1.44 × 105 erythromycin resistant colonies per 109 competent cells. Then, the colonies of the experiment group were all picked and re-screened by 5-fluorouracil. As a result, 49 of them were survive in the presence of 5-fluorouracil and contained desired mutations by sequencing confirmation (Fig. 2c, d), while none of the randomly picked colonies of the control group was alive (data not shown). These results demonstrated the ssDNA recombineering coupled CRISPR/Cas9 counterselection could achieve genomic point mutations. Meanwhile, the final mutant efficiency was 46%, indicating an off-target effect of CRISPR/Cas9 in L. lactis. The targeting efficiency of pTRKL2 based CRISPR/Cas9 system was firstly analyzed at four individual genomic locations included in the galK, hemN, recA and noxD genes of L. lactis NZ9000 (Fig. 3a). Electroporation of the control plasmid pTLCas9 generated the transformants of 2.72 × 105 cfu/100 ng plasmid DNA, while 80.5, 56.0, 46.0 and 55.5 transformants were yielded with the plasmids containing valid spacers of the four locations, respectively (Fig. 3b). Then, 12 survived colonies from each location were selected and confirmed that there was no mutation in the spacer and PAM by sequencing analysis (data not shown). These results confirmed that the pTRKL2 based CRISPR/Cas9 system had the DSB activity in L. lactis, while the off-target effects remain, which would result in false positive subpopulation following recombineering process. Then, a high copy number plasmid pTRKH2 was used to increase the concentration of the CRISPR/Cas9 elements. As shown in Fig. 3c, the targeting efficiency of the recA gene increased to 100%, and the efficiencies of the galK, hemN and noxD genes were also enhanced by sevenfold. Furthermore, the length of spacer was also optimized. Extending the spacer from 20 to 25 bp basically eliminated the off-target phenomenon for the galK, hemN and noxD genes, while further extension unexpectedly increased the off-target effects. To test the efficiency of the improved CRISPR/Cas9, the designed upp mutation was performed again, generating 58 erythromycin resistant colonies. 50 out of 58 colonies were resistant to 5-fluorouracil and contained desired mutations by sequencing confirmation, yielding a final mutation efficiency of 87% (data not shown). Therefore, a new genomic engineering tool was developed by combination of RecT-mediated ssDNA recombineering with the efficient CRISPR/Cas9 counterselection in L. lactis. To perform precise point mutation of the galK gene in the Δupp mutant strain, the targeting plasmid pTHCas9upp used for the upp mutation selection was firstly cured. Subsequently, an ssDNA oligonucleotide galKo targeting the galK gene was designed, which would bring in the bases mutation of the selected PAM sequences (Fig. 4a). After co-electroporation of the ssDNA galKo and the targeting plasmid pTHCas9galK into the Δupp mutant cells expressing RecT, the culture was recovered in the medium with erythromycin. 12 colonies were picked, and 9 of them contained the designed mutation by sequencing confirmation (Fig. 4b). This result confirmed the tool developed here permits iteratively genomic point mutation. To carry out chromosomal DNA deletion in a seamless manner, the pseudogenes noxD was selected as the target because the gene was non-essential and its deletion would not negatively affect cell growth . An 80 bp disruption oligonucleotide was designed with 40 bp homology arms upstream and downstream flanking of the deletion region which contained targeting sequence of plasmid pTHCas9noxD2 (Fig. 5a). Co-electroporation of oligonucleotide noxDo1 and pTHCas9noxD2 into the NZ9000 cells expressing RecT yielded 16 colonies per 109 cells. 10 colonies were picked and demonstrated to be the desired mutant with 50 bp in-frame deletion in the noxD (Fig. 5b). Furthermore, the deletion region was extended to 100 bp, generating 4 colonies (all expected) per 109 cells (Fig. 5c). These results confirmed that this tool could be applied to perform short genomic DNA fragment deletion seamlessly within 72 h.
To test the feasibility of this tool to insert short DNA fragment into the genome of L. lactis NZ9000, the 34 bp loxP site was selected as a target. 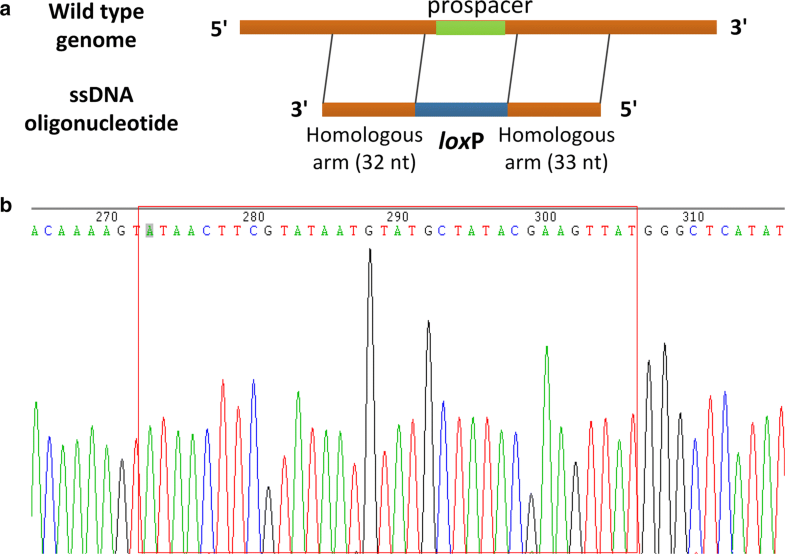 A 99 bp oligonucleotide was designed with 34 bp loxP sequence clamped by 33 bp and 32 bp homologous arms upstream and downstream of the insertional location (Fig. 6a). After co-electroporation of the ssDNA noxD-loxPo and the targeting plasmid pTHCas9noxD2 into the NZ9000 cells expressing RecT, two erythromycin resistant colonies were obtained. As shown in Fig. 6b, sequencing analysis of the two colonies showed that the loxP site was correctly inserted into the genome of colony 1, while the insertional sequence in the genome of colony 2 could partly match the loxP site. These results indicated the developed tool could accomplish insertion of short DNA sequence into the genome of L. lactis. Lactococcus lactis is an important model for LAB genetics, physiological, systematic, and applicable research, while its efficient, rapid and precise genomic modification remains yet to be addressed. In this work, we described a tool for genome engineering which incorporates the ssDNA recombineering and CRISPR/Cas9 targeting, reported for the first time in L. lactis. Through selecting suitable recombinase and reducing the off-target effect of Cas9-induced DSB, the success rate of genomic mutation was significantly improved to > 75% in L. lactis within 72 h. In contrast to the existing approaches, this protocol is highly efficient, time-saving and easy-to-use for introducing precise point mutations and performing gene deletion and insertion in a seamless manner. The primary limitation of the established genomic modification tool of L. lactis is the low efficiency of RecA-dependent homologous recombination . It is inevitable to find exogenous recombination systems. Nowadays, two kinds of prophage-derived systems have been demonstrated their recombinational function in LAB, including λ-Red like operons (using dsDNA substrate) and ssDNA recombinase (using ssDNA substrate) [4, 5, 19, 20]. Here, we were not able to obtain the recombination activity of a putative λ-Red like operon (pi10-11-12) from L. lactis IL1403 (data not shown), neither the predicted ssDNA recombinase encoded by pi12 in L. lactis NZ9000. Our failure to identify a L. lactis recombinase suggested that recombinases native to L. lactis might be markedly dissimilar in sequence and structure to those which had the activity for ssDNA recombineering . Fortunately, the four recombinases characterized in other organisms were all workable, of which the RecT from E. faecalis ATCC14506, sharing 42.81% identity to the RecT from E. faecalis V583 , showed the highest recombination activity in L. lactis NZ9000. These results agreed with the previous opinion that RecT from E. faecalis was efficient in phylogenetically distant bacteria and was a highly efficient recombinase . Moreover, the less ssDNA (as few as 10 μg) and shorter homologous arm (as short as 32 bp) were required for the selected RecT to mediate ssDNA recombineering compared with the previous works [19, 20], which could reduce the synthetic cost of ssDNA substrate. CRISPR/Cas is an adaptive immune system in bacteria and archaea against foreign genetic elements . The type II CRISPR/Cas9 system from S. pyogenes has been exploited as a facile and programmable platform for genomic manipulation in a sequence-specific manner in eukaryotes and some prokaryotes [3, 23, 33, 34]. The off-target effect is a common challenge during application of the CRISPR–Cas9 system . Previous reports demonstrated that several factors may influence the targeting efficiency, including the type of host cell, the composition of spacer sequence and the activity of Cas9 [35–37]. To our knowledge, the function of CRISPR/Cas9 has been demonstrated in L. lactis, Lb. casei, Lb. reuteri and S. thermophilus, while the off-target effect of Cas9 has not been discussed and yet to be addressed [3, 6, 21, 38]. Here, we proved that the specificity and efficiency of Cas9-induced DSB in L. lactis genome is tightly related to the concentration of CRISPR/Cas9 system and the length of spacer sequences. Through an appropriate increase in the intercellular concentration of CRISPR/Cas9 system and optimization of the length of spacer could yield a more efficient CRISPR/Cas9 based counterselection system compared with that in the previous report . Based on the RecT-mediated ssDNA recombineering coupled with the efficient CRISPR/Cas9 counterselection, a new genomic engineering tool was proposed for L. lactis. The workflow of this tool is simple, handling and can be accomplished within 72 h. Moreover, as the plasmid carrying the CRISPR/Cas9 elements was easily cured, sequential engineering was allowed. This facility provided prerequisite for high-throughput genome engineering in L. lactis. At the same time, this work revealed several interesting challenge of L. lactis genomic modification. First, a targeting plasmid containing two spacers with upp and galK was constructed, and the possibility to simultaneously edit multiple sites in the genome which was feasible in E. coli was also tested , but failed in L. lactis (data not shown). We speculated that the failure might be due to the limitations of the homologous recombination of the RecT. Future improvements of the homologous recombination system in L. lactis may allow simultaneous multi-locus editing of the genome. Second, compared with point mutation, gene deletion mediated by the tool developed here was less efficient by about 100-fold in L. lactis, and the deletion of longer chromosomal DNA (150 bp) did not success. These phenomena were also observed in other organisms . We speculated that the binding capacity of oligonucleotide for gene deletion might be weaker than that for point mutation, leading to relative low recombination efficiency. Third, one of the two colonies produced during loxP site insertion could partly matched the loxP site, suggesting that unexpected mutation could be brought in the synthetic of long ssDNA oligonucleotide (99 bp). Fourth, due to restrictions in the length of synthetic ssDNA substrate, large DNA fragment cannot be inserted into the chromosome through the method developed here. Fortunately, the engineered L. lactis with an intact loxP site constructed here will be applicable for gene insertion mediated by the Cre/loxP site-specific recombination system . In summary, a new tool was developed to mediate synthetic oligonucleotide into the L. lactis genome by ssDNA recombineering and kill cells without expected mutations by CRISPR/Cas9 counterselection. Through selecting a suitable recombinase and improving the CRISPR/Cas9 lethality, this tool can achieve precise point mutation, seamless deletion and insertion at efficiencies of > 75% within 72 h. This powerful tool will fulfill high-throughput genetic engineering and facilitate studies to peek deep into the role of specific genes and reveal their novel function in L. lactis. Bacterial strains and plasmids used in this study are listed in Table 1. L. lactis strains NZ9000, its mutants and IL1403 were routinely grown in M17 medium (Oxoid, Basingstoke, United Kingdom) supplemented with 0.5% (wt/vol) glucose (GM17) at 30 °C under static conditions. When needed, L. lactis was grown in semi-defined M9 medium supplemented with 0.4% glucose (GM9) at 30 °C under static conditions . Enterococcus faecalis ATCC14506, Lb. casei BL23, Lb. plantarum WCFS1, Lb. delbrueckii SDMCC050201 were grown statically at 37 °C in MRS medium (Oxoid, Basingstoke, United Kingdom). Escherichia coli strains were grown aerobically at 37 °C in Luria–Bertani (LB) medium. If necessary, chloramphenicol (Sangon, China) was used at 5 μg/mL for L. lactis or 10 μg/mL for E. coli, erythromycin (Sangon, China) 10 μg/mL for L. lactis or 250 μg/mL for E. coli, rifampicin (Sangon, China) 25 μg/mL for L. lactis. Nisin (Sigma, USA) was added to a final concentration of 10 ng/mL. 5-fluorouracil (Sigma, USA) was added to a final concentration of 10 μg/mL. Bacteria genomic DNA extraction was carried out using a TIANamp Bacteria DNA kit (TIANGEN, China). Plasmids from E. coli were extracted using a Plasmid Mini Kit (Omega, USA). Restriction enzymes, T4 polynucleotide kinase and T4 DNA ligase were used as stated by standard procedures from New England Biolabs (NEB). High-fidelity DNA polymerase for cloning purposes and Taq polymerase for screening purposes were purchased from NEB and Takara (Japan), respectively. Primers and oligonucleotides were supplied by Tsingke Biological Technology Ltd. (Tsingke, China) and listed in Additional file 1: Table S1. DNA sequencing was performed by Biosune Biotechnology., Ltd. (Shanghai, China). Six ssDNA proteins, Redβ of E. coli prophage λ, RecT of E. faecalis ATCC14506, LCABL_13050 of Lb. casei BL23, Lp_0641 of Lb. plantarum WCFS1, phiJB_00020 of Lb. delbrueckii SDMCC050201 and pi12 of L. lactis IL1403 were tested for the functionality and efficiency of ssDNA recombination in L. lactis. Redβ was amplified from pKD46 with primers RedβF and RedβR. recT, LCABL_13050, Lp_0641, phiJB_00020 and pi12 were amplified from the genomic DNA of strain ATCC14506, BL23, WCFS1, SDMCC050201 and IL1403 with primer pairs RecF/RecR, LC50F/LC50R, LP41F/LP41R, JB02F/JB02R and Pi12F/Pi12R, respectively. The yielding DNA fragments were digested and inserted into the compatible sites of the vector pSec:Leiss:Nuc, generating the recombinant plasmids pL-beta, pL-RecT, pL-LC50, pL-LP41, pL-JB02 and pL-pi12, respectively. Lactococcus lactis NZ9000 carrying one of the above six recombinant plasmids was made electro-competent cells according to the previous method with some modification . Briefly, cultures were grown at 30 °C in GM17 medium supplemented with 1% (wt/vol) glycine and 17% (wt/vol) sucrose. Nisin was added at an OD600 of 0.2 for induction of expression of the recombinase. Cells were harvested at an OD600 of 0.4, washed twice in ice-cold 10% glycerol supplemented with 17% (wt/vol) sucrose, and concentrated 125-fold. 100 μg (or 40, 20, 15, 10, 5, 1 μg) oligonucleotides were mixed with the competent cells and transferred to pre-chilled 0.2 cm electroporation cuvettes, and then electroporated at 2000 V, 20 μF and 200 Ω. Cells were recovered in 1 mL SGM17 medium (GM17 supplemented with 7.63% sucrose, 0.4% MgCl2, and 2.2% CaCl2) for 2 h at 30 °C and plated onto GM17 agar selective plates. To screen easily, the rpoB gene (locus tag llmg_1982) encoding DNA-directed RNA polymerase subunit β was employed as a target . Oligonucleotide rpoBo1 was designed to introduce a H486 N point mutation, yielding a rifampicin-resistant phenotype. Viable cells on the GM17 agar plates containing rifampicin were detected by a mismatch amplification mutation assay-PCR (MAMA-PCR) with primers rpoB-MAMAF1, rpoB-MAMAF2 and rpoB-MAMAR . Plasmid pCas9 was purchased from Addgene (plasmid #42876). To adapt CRISPR/Cas9 to L. lactis, DNA fragment containing tracrRNA, cas9 and crRNA was PCR amplified from the plasmid pCas9 with primers 9-1F and 9-1R, and inserted into the BglII/PstI sites of pTRKL2 or pTRKH2, generating vector pTLCas9 or pTHCas9. To target the upp gene (locus tag llmg_2176) in the genome of L. lactis NZ9000, oligos upp-sp-20F/upp-sp-20R and upp-sp-25F/upp-sp-25R were phosphorylated and annealed. The products were diluted and inserted into the BsaI digested pTLCas9 and pTHCas9, generating pTLCas9upp and pTHCas9upp, respectively. To target the galK gene (locus tag llmg_2235), hemN gene (locus tag llmg_1418), recA gene (locus tag llmg_0374) and noxD gene (llmg_pseudo_74) in the genome of L. lactis NZ9000, oligos galk-sp-20F/galk-sp-20R, hemN-sp-20F/hemN-sp-20R, recA-sp-20F/recA-sp-20R and noxD-sp-20F/noxD-sp-20R were phosphorylated and annealed to produce spacers, respectively. The spacers were diluted and inserted into the digested pTLCas9 or pTHCas9, generating pTLCas9galK1, pTLCas9hemN1, pTLCas9recA1, pTLCas9noxD1, pTHCas9galK1, pTHCas9hemN1, pTHCas9recA1 and pTHCas9noxD1, respectively. To find the optimal length of spacer, the 25 bp and 30 bp spacers targeting the same position as the 20 bp spacer of the galK gene were also inserted into pTHCas9, generating pTHCas9galK2 and pTHCas9galK3. With the similar strategy, the 25 bp and 30 bp spacers targeting the hemN, recA and noxD gene were inserted into pTHCas9, respectively, generating pTHCas9hemN2, pTHCas9hemN3, pTHCas9recA2, pTHCas9recA3, pTHCas9noxD2 and pTHCas9noxD3. Lactococcus lactis NZ9000 recombinant carrying plasmid pL-RecT were made electro-competent cells as the above method. To describe the detail protocols, we took site-specific mutagenesis of upp gene as an example. The prepared competent cells were co-transformed with 10 μg of oligonucleotides uppo and 100 ng of target plasmid pTLCas9upp. After recovery, cells were plated on GM17 agar containing erythromycin. The genome of colonies containing desirable modification will not be cleaved by Cas9, and therefore the viable cells on the selective plate are potential recombinants. The candidates were tested by the growth in the GM9 medium supplemented with 5-fluorouracil and PCR amplification with primers upp-tF/upp-tR, and further confirmed by sequencing. The plasmid pTHCas9upp was cured by streaking the Δupp mutant harboring pTHCas9upp on the GM17 agar plates without erythromycin. Then, the picked colonies that were grown on GM17 medium but not grown on GM17 medium containing erythromycin were considered as the pTHCas9upp free. The other genomic engineering experiments were performed as the above protocol. For site-specific mutagenesis of the galK gene, the target plasmid pTHCas9galK2 and oligonucleotides galko1 were used. The mutants were tested by PCR amplification with primers gal-tF/gal-tR, and further confirmed by sequencing analysis. For genomic DNA deletion and insertion, the target plasmid pTHCas9noxD2 and oligonucleotides noxDo1 (50 bp deletion), noxDo2 (100 bp deletion) or noxD-loxPo (loxP site insertion) were used. The mutants were tested by PCR amplification with primers noxD-del-tF/noxD-del-tF, and confirmed by sequencing analysis. Statistical analysis was performed using unpaired two-tailed Student’s t tests. P < 0.05 were considered statistically significant. P < 0.01 were considered statistically high significant. TTG, YPX and JK conceived and designed the experiments, TTG, YPX, YZ and XYG carried out the experimental work. TTG, YPX and JK wrote and revised the manuscript. All authors read and approved the final manuscript. We would like to thank N. Galleron for his generous gifts of Lactococcus lactis NZ9000 and plasmid pLeiss:Sec:Nuc. The data sets supporting the conclusions of this article are included within the article and its additional file. This work was supported by the National Natural Science Foundation of China (NSFC, Grant Nos. 31871767 and 31400077) and the Public Service Sectors (Agriculture) Special and Scientific Research Projects (Grant No. 201503134). 12934_2019_1075_MOESM1_ESM.docx Additional file 1: Figure S1. Confirmation of rpoB H486N recombineered colonies. (A) MAMA-PCR based confirmation. (B) Sequence comparison between wild type and the designed mutant. (C) Sequence analysis of the colonies with rifampin resistance. In panel (B), mutations introduced by the ssDNA oligonucleotide are shown, with H486N missense mutation indicated as bold and bases as red. Table S1. Primers and oligonucleotides used in this study.